Seven homes that are part of a Millcreek homeowners association were included in a blight study commissioned by the city. When Tina Grant bought her two-story duplex on Elgin Avenue in Millcreek three years ago, it was a tidy little block with three other houses. Today, hers is one of two homes still standing, alongside a couple big mounds of dirt and an empty lot which will soon be the site of 14 newly constructed townhomes. Millcreek officials have big plans for the area. Grant's street is the site of just one of the development projects coming to Millcreek. Earlier this year, Millcreek officials announced plans to develop a city center that would act as a gathering space in the heart of town. As part of those development plans, the city commissioned a blight study, which looked for properties with issues such as chipped paint, graffiti, broken windows and doors. Among those homes was Grant’s, which came as a surprise to her. “I’m blighted for not having curb and gutter,” said Grant, who also has cracks in her driveway. Her neighbor’s home was also listed with missing curb and gutter and a dilapidated porch. 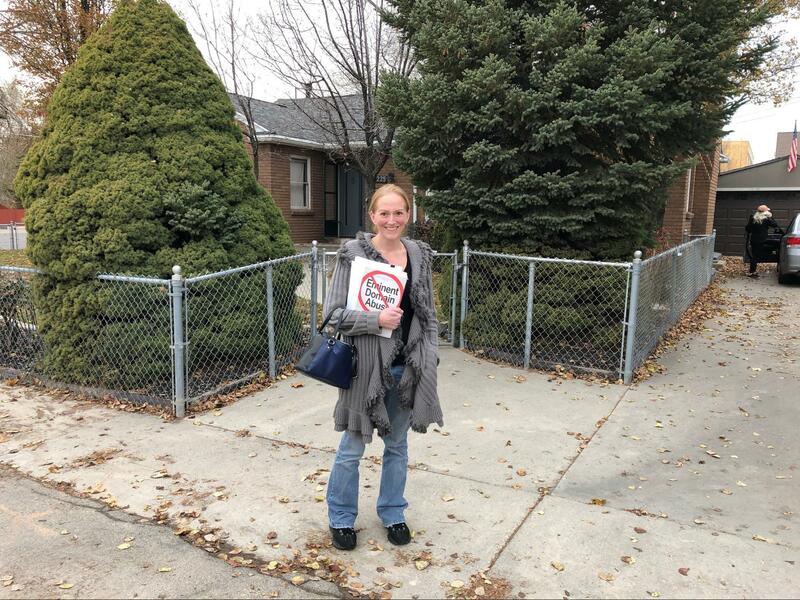 Tina Grant stands in front of her neighbor's property on Elgin Avenue on Tuesday, November 27. Grant and her neighbor's home were noted on Millcreek's blight study for missing sidewalk and gutter. About a mile away from Grant’s property an entire HOA community was listed for lack of sidewalk, said Aaron Walker, one of the seven homeowners there. Property owners like Grant and Walker and even some businesses are concerned that the study will give the city reason to seize their property. Residents say they are not opposed to the proposed city center or development projects. They are just concerned about the way the city is going about it. At issue is eminent domain, a legal tool the city could use if there was one property standing in the way of a positive development project. Mayor Jeff Silvestrini said in an interview last month the city isn’t preparing for that. Several businesses are also worried that they will also be pushed out to make way for the city center. In fact, the fate of Plowgian Auto Repairing, Inc., located on 3300 South and Highland Drive, is pretty much sealed, said Jeff Plowgian, the auto shop’s owner. His business will need to relocate to make room for a proposed park strip or road in the current designs for Millcreek’s city center. If the plans are approved, it would be second time the shop has been threatened by a development project in its 90-year history, Plowgian said. Last week, the city presented a new map which removed some properties, including Walker’s, from the blight study, but Grant and Walker said they are not convinced that this is over yet. Grant is one of the organizers of a group calling itself Millcreek Land Grab. It is urging property to make repairs and documented evidence of their work so they can demand Millcreek officials remove them from the blight study area. But in Grant’s case, she said she can’t fix the cracks on her driveway until the city comes and adds sidewalk and gutters in front of her property. She said she was previously told that would happen after Millcreek incorporated less than two years ago. Walker wonders if the blight study would still have existed if he and other residents hadn’t voted in favor of incorporation about three years ago. At the time, he said he didn’t see anything wrong with incorporating Millcreek. “In the way this is all transpired, it makes it look like either they were not prepared for how to do this properly or that they do have some sort of other motive when it comes to developing the area for their own interests versus the interests of single family home owners,” Walker said. The city will hold a final hearing on the blight study on Monday and a vote on whether to blight the neighborhoods on Dec. 17.